International Recognition For Peradeniya Engineering Faculty Undergraduates. Engineering faculty final year electrical and electronic engineering students SSP Vithana, AMR Abeysekara, and TSJ Oorloff received the best paper award at the recently concluded 17th International Conference of Advances in ICT for Emerging Regions (ICTer2017) organized by the School of Computing, University of Colombo. Out of 50+ papers presented, the paper titled "Hyperspectral Imaging Based Land Cover Mapping Using Data Obtained by the Hyperion Sensor" was adjudicated the best paper because of its superior technical contribution. The ICTer 2017 is technically co-sponsored by the IEEE, USA. The paper was an outcome of an undergraduate project supervised by Dr. H.M.V.R. Herath, Dr. G.M.R.I. Godaliyadda, and Dr. M.P.B. Ekanayake of the department of electrical and electronic engineering. 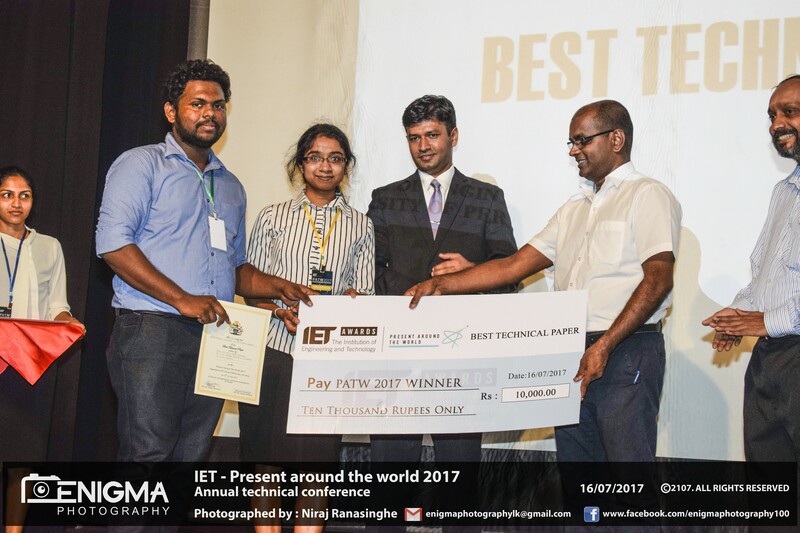 University of Peradeniya wins the best technical paper award at IET “Present Around the World 2017”. The institution of Engineering and Technology (IET) is one of the premier professional engineering organizations in Sri Lanka with the headquarters in the United Kingdom. IET Sri Lanka in one of the active branches of the IET global network. The Young Professionals Section of the IET Sri Lanka consisting of Young Engineering professionals and engineering undergraduates. It’s involving in the career development of young engineers and engineering undergraduates. 15th Annual Technical Conference “Present Around the World 2017” of the IET Young Professionals Sri Lanka, one of the major events of the event matrix of the year was held at Faculty of Engineering University of Peradeniya on 16th July 2017. The Annual Technical Conference is creating an opportunity for young researchers in the IET disciplines to present their research outcomes and knowledge sharing between academic, industrial professionals and young engineers. Paper Title - "Object Dimension Extraction for Environment Mapping with Low Cost Cameras Fused with Laser Ranging"
SachiniEkanayake, Department of Electrical & Electronic Engineering. 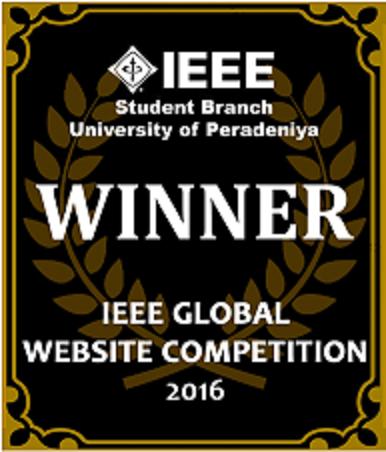 The IEEEXtreme 10.0, the global coding competition for the year 2016, was held from 5.30 a.m. on 22nd October until the following day morning at the Computer Engineering Department premises of University of Peradeniya. Thousands of student groups from around the world participate in this global coding competition organized every year by the world’s largest professional body, the Institute of Electrical & Electronic Engineers (IEEE). 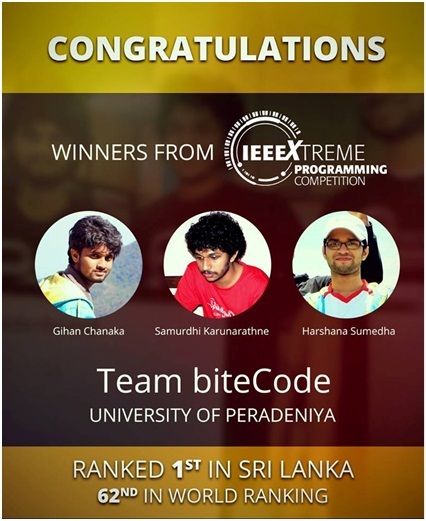 In this year, more than 30 teams represented IEEE Student Branch of University of Peradeniya in IEEEXtreme 10.0 while many teams including team "biteCode" and team "Codebros" lead the Sri Lankan leader board from the very beginning. And at the end of the 24 hours, team ‘biteCode’ secured the first place in Sri Lanka and 62nd place in the world leader board. The team “biteCode” was represented by GihanChanaka, SamurdhiKarunarathne, andHarshanaSumedha. 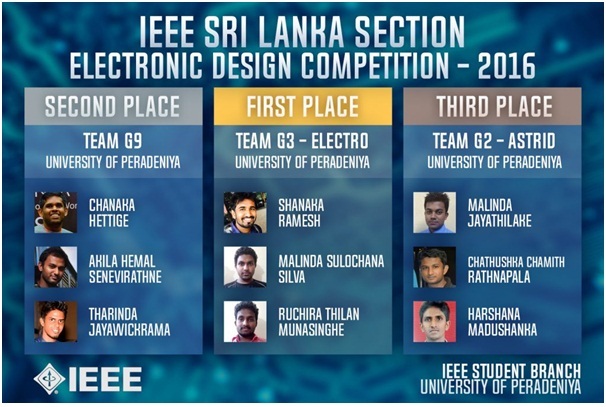 The 4th IEEE Electronic Design Competition for undergraduate students organized by the IEEE Sri Lanka was held in University of Peradeniya and University of Moratuwa with the participation of over 30 groups from five universities on 14thJanuary 2017. The competition was a great success and the participants were able to collaborate with their own team members to design a Hi-Fi audio amplifier to their own specifications. A notable achievement this year was that all the three top positions of this competition was won by teams from University of Peradeniya. The following were the winners of the completion. The annual Global Website contest organized by the Institute of Electrical and Electronic Engineers (IEEE) was held recently. The team representing the student branch of University of Peradeniya was able to win the first place in Asia Pacific Region and then the first place at the global contest. Teams from all around the world, including giant nations like USA, Japan, India etc took part in this contest. The main purpose of their website is to enlighten the global community of the activities, research and projects carried out by the student branch. It also publishes technical articles produced by student members. Institute of Electrical and Electronic Engineers (IEEE) is the world’s largest professional organization with over 420 000 members from more than 160 countries. We cater for the technological enthusiastic professionals of the world in the related fields through standardization, technical conferences, financial and technical assistance, networking opportunities and many other ways to enable the advancement of technology for the betterment of humanity. IEEE Sri Lanka section, which is a part of IEEE Region 10 (Asia Pacific Region), is the local body of IEEE who are working towards the above mentioned common goals with the local community. IEEE Sri Lanka Section was established back in 2003 and currently we have a member base of over 1900, which spans from undergraduates to most senior citizens. National Instrument website recognise one of our undergraduate design project which investigates the design and simulation of a unique wideband coupler that improves directivity by increasing the number of stages of the coupled line coupler. Dr. H. A. Suraweera was awarded the CVCD award of the most outstanding Junior Researcher in the field of Technology and related Sciences including Engineering, Architecture, Quantity Surveying and Information Technology. The following students from DEEE are the winners of the IEEE Electronic Design Competition 2014 which was held on 22nd Nov. 2014 with the participation of 27 groups at three locations. 1st Place: Group "3 Idiots" from University of Peradeniya: Jayasinghe M.G.S., Perera L.S.C., Weerakoon W.M.D.S. 2nd Place: Group "SParoos" from University of Peradeniya: Fernando W.S.K., Perera P.H., Herath H.M.S.P.B. 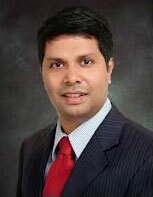 Dr. Ruwan Ranaweera was a recipient of the President’s Awards for Scientific Publications 2010, 2011, 2012 which was awarded by the National Research Council of Sri Lanka to honor the scientists for highly rated scientific research as evaluated by peers and published in a top 10% SCI indexed journal. He received his award at the awards ceremony held on 31st October 2014 at the Water’s Edge Hotel, Battaramulla. The ceremony was graced by his Excellency the President Mahinda Rajapaksha, Hon. Patali Champika Ranawaka, Minister of Technology and Research, and Mrs. Dhara Wijayathilake, Secretary, Ministry of Technology and Research. Out of a 219 papers presented at the IEEE International Conference on Industrial and Information Systems (ICIIS2014), held on 15-17 December 2014 at Gwalior, India two papers from students and staff of the department have adjudged as the best paper and the second best paper. The best paper: "Human motion tracking under dynamic background conditions" by Mr. W. S. K. Fernando, Mr. H. M. S. P. B. Herath, Mr. P. H. Perera, Dr. M. P. B. Ekanayake, Dr. G. M. R. I. Godaliyadda and Dr. J. V. Wijayakulasooriya. The second best paper: "Wideband asymmetric coupler with optimally positioned capacitors for improved directivity" by Mr. A. C. M. Ahamed, Mr. K. D. D. Amarathunga, Mr. D. V. Rathnayake and Dr. A. U. 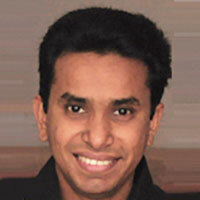 A. W. Gunawardena.